Exit polls from Election Day indicated that President Barack Obama won 67 percent of the Latino vote, and John McCain 32 percent. This compares to estimates of Latino support for George W. Bush in the range of 39 percent or higher in 2004. In 2000, Bush is thought to have received 35 percent of the Latino vote. The drop in support among Latinos for Republicans between 2004 and 2008 was part of a broad-based electoral movement away from the GOP, and was hardly specific to that demographic group. McCain received only 57 percent of the white male vote, compared with 62 percent for Bush in 2004, and McCain’s 55 percent of regular churchgoers was significantly lower than Bush’s 61 percent. Credible surveys indicate that the major policy concerns of Latinos were no different than the concerns of non-Latinos: The economy and jobs topped the list. There is little evidence that immigration policy was an influential factor in Latinos’ choice between the two candidates once basic party predispositions are taken into account. McCain’s consistent history of advocating a legalization program for illegal immigrants made no impression on Latino voters. McCain lost the Latino vote by a wide margin even in his home state of Arizona, 56 to 41 percent. This was in spite of widespread news coverage of his immigration stance in that state. In 2008, Latino voters supported the GOP ticket at levels above the usual 30 percent only when they resided in states that were already safely in GOP hands. The size of the Latino voting population should be kept in perspective alongside other subsets of the electorate. An estimated 11.8 million voters were of Latino ancestry, compared with 17 million African Americans, 19.7 million veterans, 23.6 million young people, 45 million conservatives, and 34 million born-again white Christians. The 2008 presidential election provided yet another opportunity to assess stability and change in the basic partisan commitments of voters. For almost 10 years now, leading GOP strategists have suggested that the party is on its way to making lasting inroads with Latino voters. Unfortunately, the 2008 results indicate that the party is no closer to this goal now than it was when it started. Exit polls on Election Night indicated that President-Elect Obama won 67 percent of the Latino vote; performing a bit better among Latino women (68 percent) than among Latino men (64 percent). (Results can be viewed on the CNN Election Center 2008 website at the following address, accessed December 15, 2008: http://www.cnn.com/ELECTION/2008/results/polls/#USP00p1.) The Pew Research Center’s national survey taken the weekend before Election Day showed virtually the same results: 32 percent for McCain and 68 percent for Obama. The quixotic and costly Republican efforts to realign a large share of Latino voters have evidently been a failure, and for the reasons that I have identified in several previous CIS Backgrounders (Gimpel and Kaufmann 2001; Gimpel 2007; 2004). The Hispanic population consistently identifies by a margin of 2:1 with the Democratic Party, and it is heavily concentrated in places where the local Republican Party presence is weak — especially in larger cities and older suburbs. Given that new voters learn their politics from those around whom they live and work, the Latino concentrations in the nation’s most Democratic cities and counties provides little opportunity for regular exposure to anyone with Republican allegiance. In many of these locales, there are few Republican candidates even on the ballot. As I have indicated elsewhere, very few Latinos are migrating into Republican-heavy communities, where they might develop some affinity for the Grand Old Party’s politics (Gimpel 2007). Notably, where you do find Latinos living among Republican majorities, they are stronger in their support for GOP candidates, but the gap in party identification stems precisely from the fact that there are far fewer of them residing in such locations. The upshot of the steadiness of Latino support for the Democratic Party is that a campaign cannot sway Latinos, or any other group, by simply broadcasting a few ads, making an extra campaign stop, or by announcing a new policy vision — nor does it help much if you do it in a foreign language. The vast majority of voters, Latino or otherwise, are not sufficiently attentive to campaign activities for those efforts to pay significant dividends. Among those who are most attentive to campaigns, outreach messages fall on unsympathetic ears. Some have suggested that voters are selectively attentive when they view campaign-related information, commonly screening out or sharply discounting news and advertising content that is discrepant with what they already believe (Taber and Lodge 2006; Taber, Lodge, and Glathar 2002; Faber and Storey 1984). This may be true, but a simpler account suggests that incoming content is filtered through the application of prior beliefs. A campaign ad for a candidate, for instance, is simply evaluated using different criteria by Republicans than it is by Democrats (Gerber and Green 1999, 206). Prior feelings and prejudices always come into play. Whichever theory of biased learning is used to explicate it, the result is the same: stability in political attitudes rather than change even in the face of vigorous campaigning. No voter begins an election year as a blank slate, and one does not have to be a zealot to be resistant to new political arguments (Taber and Lodge 2006, 767). Considering the entrenched Democratic Party loyalties of Latino registrants, the legions of Latinos who are noncitizens, and those who are citizens but remain unregistered and do not vote, surprisingly few Latinos are persuadable targets of campaign outreach. This is why no reasonable amount of party effort will turn them in any short amount of time. Latino support for the McCain-Palin ticket varies by state because this population does not have the same socioeconomic profile at every location. Moreover, Latino voters are no different from any other voter, subject to favorite son appeals, as McCain did best in Arizona, winning an estimated 41 percent of the Hispanic vote, while losing to Obama in the Illinois Senator’s home state: 72 percent to 27 percent (see Table 1). The fact that McCain won as much as 27 percent of Latino votes in Illinois testifies to the durability of party identification in determining vote choice. Republicans can count on a small but loyal base of Hispanic supporters year in and year out even when the playing field is tilted against them. Most campaigning occurred, however, in battleground states, and not in Arizona and Illinois. If any Latino votes were up-for-grabs, they should have been subject to campaign persuasion efforts in the highly competitive states. Among the battleground states for which exit polling tabulations for Latino voters are listed, the results were not encouraging for Republicans awaiting a big payoff for efforts aimed at attracting Latinos. McCain’s worst performance among Latinos was in Nevada, a state George W. Bush won in both 2004 and 2000. There McCain managed to garner just 22 percent of the Hispanic vote, compared with Bush’s estimated 39 percent four years earlier. In Texas, considered a safe Republican state in presidential elections, McCain captured just 34 percent of the Latino vote (see Table 1), compared with Bush’s estimated 49 percent in 2004. The Pew Research Center Survey, conducted from October 29 to November 1, closely predicted the final outcome on Election Day. Results from this survey suggest that the Republican ticket fared badly among Latinos across Battleground States; with Obama winning 72 percent of the vote (see Figure 1). Surprisingly, this was a bit better than his performance in the safest Democratic states, where he won an estimated 71 percent! Fortunately for Republicans in the heavily GOP states, Latinos split more evenly, and Obama was held to 58 percent. But this was still far more Democratic support than he received among non-Latinos in the safe GOP states, at just 43 percent. In 2008, Latino voters supported the GOP ticket at levels above the usual 30 percent only when they resided in states that were already safely in GOP hands. In competitive and Democratic states, they predictably supported Obama. The excitement of Latinos for the Obama-Biden ticket ran consistently strong even in states that were not in question. The only conclusion to be drawn from the evidence is that there were few Latino votes that were in play by October when the major campaigns were gearing up for their final push. Further down the ballot, Republicans did not fare any better among Latino voters in 2008 than in previous years. According to the exit polling for the U.S. House races, Latinos favored Democrats 68 percent to 29 percent. Latinos were significant large voting blocs in four states with contested U.S. Senate seats: Colorado, New Mexico, Texas, and Virginia. In all four, Latinos cast over 61 percent of their votes for the Democratic candidates with the total reaching 71 percent for Mark Warner in Virginia. A number of studies have shown that Republicans fare better among Evangelical and “born-again” Latinos than they do among traditional Catholics or the non-religious (Kelly and Kelly 2005; Kelly and Morgan 2008; Lee and Pachon 2007). There is certainly support for this contention in the pre-election Pew Research Center Survey. Latinos identifying themselves as “born-again” supported Obama 57 percent to 43 percent, compared with the 67 percent he won among the broader Latino electorate. Further statistical analysis reveals that these born-again Latinos were Republicans to begin with so it’s not at all clear that their religious adherence is the source of their support for John McCain. Once you account for their political party identification, the impact of their religious confession does not make a statistically significant difference to their vote choice. A mass religious conversion of Latinos to Evangelical Christian tenets might be one dream of Republican strategists, but apparently it will only work if that effort makes these Latino conversion targets Republican Party supporters first. What consultants commonly identify as “pro-Republican values” among an ethnic population, are the values most strongly held by the already Republican segments of that population. Latino Evangelicals may be more pro-traditional family and pro-life than the legions who are nominally Catholic or not religious at all, but they are also more likely to be found worshipping in Republican-leaning congregations, and identifying as Republicans in the first place. By now, a number of post-mortem analyses have shown that the drop in support among Latinos was part of a broad-based electoral movement away from the Republican ticket compared with four years ago, and was hardly specific to that demographic group. As Table 2 shows, Latino support for the GOP nominee dropped from where it was in 2004, but support for John McCain dropped among most other segments of the electorate as well; most significantly among young voters (-13 percent), the very wealthy (-17 percent), those without high school diplomas (-13 percent), and those earning less than $15,000 per year (-11 percent) — many of whom are also students. Comparisons of the exit polls for the two election years also suggest that President Bush outperformed McCain across a wide variety of cultural groups thought to be well entrenched behind the GOP, including those who had previously served in the military (-3 percent); among born-again Christians (-4 percent); rural residents (-4 percent); and those who attend church weekly (-6 percent) (see Table 2). Seemingly modest losses among college graduates (-3 percent) and among white men (-5 percent) are of particular moment because these blocs are such a large share of the total voting population (see Figure 2). According to estimates derived from the 2008 exit polls, college graduates numbered 57.8 million, casting about 44 percent of total votes. White men numbered about 47.2 million or 36 percent of total votes cast. By contrast, Latinos cast an estimated 11 million votes, or around 9 percent of the total (see Figure 2). The lower turnout of commonly Republican constituencies and higher turnout among regular Democrats also reconstituted the mix of interests in the 2008 electorate compared with four years ago. For example, rural voters were only 21 percent of the total electoral pie in 2008, compared with 25 percent in 2004. African American and Latino turnout in 2008 were well above 2004 levels, another source of the more lopsided vote share won by the Democratic nominee (see Table 2). Credible observers can agree that the Republican performance among Latinos in 2008 was unimpressive, but the lackluster showing was a more general pattern hardly confined to this subset of the population. Some have insisted that the election’s results are a direct consequence of Republicans turning against open and generous immigration policy in the years since 2004, when George W. Bush did better among Latinos. Republicans are said to have tarnished their brand among Latinos in the intervening years by opposing immigration legislation that would have granted legal status to millions of illegal immigrants. Florida Senator Mel Martinez insisted on NBC’s Meet the Press that anti-Hispanic rhetoric among Republicans would relegate the party to minority status. The fact that four years ago George W. Bush did better than John McCain among numerous other electoral groups, not just Latinos, seems lost on these commentators. Did young voters and the affluent also desert the McCain-Palin ticket because of position-taking on specific policies between 2004 and 2008? Perhaps Barack Obama’s campaign promise to tax wealthy Americans is responsible for the dramatic movement in his direction of those earning more than $200,000 per year? No one can easily argue that the broadly based electoral movement away from the GOP shown in Table 2 resulted from Republicans (or John McCain) taking adverse policy positions in the years between 2004 and 2008 on immigration or any other issue. The evidence that specific issues mattered is pretty weak. Latino voters just aren’t that different from other voters in the national electorate. Their support for Republicans rises or falls when support for GOP candidates rises among the broader electorate of which they are an important part. There is nothing mysterious in the election results and no evidence that indicts immigration policy as the reason for Republicans’ poor showing among any of the myriad groups identified in Table 2. Alternative explanations for the election outcome going to the strength of party identification, the higher turnout of the Democratic base relative to the Republican base, and widespread concerns about the economy, are far more plausible. Arguably, what the various election surveys show is that Latino support for the Democratic Party was quite stable and predictable this year as in previous years. Political support for a candidate almost never hinges upon a single issue. In any given election, announced issue positions usually fall on deaf ears. When queried directly, survey respondents will certainly offer opinions in response to questions about issues, it’s far less certain that they know anything about the candidates’ positions on those issues, or will vote on the basis of their issue opinions on Election Day. Elites and immigration-oriented advocacy groups are quite sensitive to campaign policy chatter, the masses are far less so. Evidence from polling conducted by the Pew Hispanic Center in mid-summer indicated that the major policy concerns of Latinos were no different than the concerns of non-Latinos: the economy, jobs, and education topped the list. (Results of the Pew Hispanic survey, accesses December 15, 2008, are reported here: http://www.cnn.com/2008/POLITICS/07/24/pew.latino.poll/index.html.) The War in Iraq and immigration policy were ranked as lower policy priorities. Even at that point in the contest, well before the national party conventions, Hispanics preferred Obama overwhelmingly, indicating that they were quick to come aboard the nominee’s bandwagon in spite of having supported Hillary Clinton throughout the presidential primaries. There were virtually no differences in support for Obama between native-born or foreign-born Latinos (Lopez and Minushkin 2008, 27). Apparently, nothing McCain and the Republicans did through the fall altered the basic pattern of support for Obama reported by the Pew Hispanic Center’s July survey. Some undecided voters came McCain’s way over the course of the fall months, but they were likely following weak party cues, or taking the advice of friends and family, not making up their mind based on new policy information. As for immigration policy, per se, there is little evidence that it was an influential factor in the choice between the two candidates by October and November. As a generic issue priority among voters, concern about immigration actually favored McCain, according to the Mid-October Pew Research Center survey conducted about two weeks prior to the election. 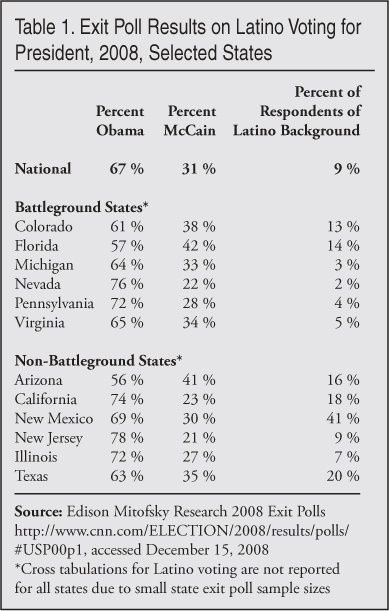 But when respondents were asked in the same survey whether they favored a program to legalize illegal immigrants (conditional upon them being employed, the payment of fines, and the conduct of a background check) Latinos who were supportive of such an option preferred Obama by an 80 percent to 20 percent margin, in spite of the fact that McCain had sponsored legislation to accomplish exactly that just a year before (see Table 3). John McCain’s consistent history of taking stands in favor of lenient immigration laws made no impression. He gained nothing from it against a candidate in the Democratic Party who held even more liberal views. Finally, all indications are that Latino turnout was higher than it was in 2004. The greater mobilization of Hispanics across the nation may well account for the greater support for Barack Obama, not Republican positioning on immigration policy. As I have pointed out in previous CIS Backgrounders, George W. Bush often did well among Latinos at times and in locations where turnout was especially low, for example, in his 1998 gubernatorial reelection bid (Gimpel 2003). Misreading these results may have fooled naive strategists into believing that Republicans could quickly alter the basic partisan loyalties of Latinos if the right candidate was running or the proper issue mix was selected. In reality, though, winning a larger share of Latino votes due to low turnout is not the same thing as converting Latinos to the Republican Party through campaign appeals or clever selection of issue positions. Conversely, when Latino support for Democrats rises, as it did in 2008, that may have little to do with issues, policies, or even candidates. Campaigns are not trivial, but they are not everything, either. Some campaign activity is efficacious in reaching voters, most of it is not. Those who want their readers to believe that the election hinged on a single issue will commonly misuse polling data by showing that a difference in support for a policy viewpoint is associated with voting for the candidates. This simplified kind of analysis ignores several realities: First, few voters care enough about a single issue to make it the sole determinant of their vote. Second, party identification remains the overriding cue for vote choice, and issue positions are often only spuriously related to support for candidates. Finally, such evidence vastly over-intellectualizes the vote decision, portraying voters as far more knowledgeable and engaged than they are. Most voters are paying only intermittent attention to the campaign, not studying every campaign ad and attending every local event. What stays the same across multiple election cycles is far more impressive than what changes (Huckfeldt and Sprague 1995). But stability and loyalty in political choice do not make for very exciting news stories. Consultants become much less important if voters are inattentive and content to let most campaign advertising pass them by. Interest group elites look politically irrelevant if their positions are not somehow found in mass preferences. For all of these reasons, those residing inside the Washington Beltway greatly exaggerate the connection between public opinion and policy issues. In summary, the 2008 election has no clear implications for immigration policy making and for a very straightforward reason: Neither candidate campaigned on the issue, nor was it clear that their positions were appreciably different. Over the long term, Republicans can expect to enlarge upon their voting margins among Latinos as Latinos become more prosperous and move into areas of existing Republican Party strength where they can develop ties to other GOP adherents. As it stands, what separates Republican-identifying Latinos from Democrats is primarily religion and income. Involvement in Evangelical church circles is clearly associated with Republican Party gains among Latinos, but promoting religious conversion seems like an unusual and possibly controversial way to go about building a base of party support. As long as Latinos remain in lower income brackets, an outcome virtually assured by sustained high levels of unskilled immigration, the Democrats will continue to maintain their lopsided edge. American ethnic history has shown that the path to Republican Party identification is a slow and multi-generational one. The greater the education and skills deficit new immigrants arrive with, the longer this political migration process will take. A few critical comments on the recent CIS Backgrounder, "Latino Voting in the 2008 Election: Part of a Broader Electoral Movement," (see here, for instance) have surfaced on various blogs in the last few days. This is a good thing, as it draws attention to the fact that the stories that are being told about the GOP losses in the 2006 and 2008 elections need to be challenged. Elections are complicated, and always subject to multiple interpretations as to why the results came down the way they did. The best way to gauge which interpretation is correct is to examine evidence for alternative explanations, not shout louder than the other person. As an important sidebar to this discussion, I don't think anyone is arguing against the importance of the Republicans continuing to broaden their base. No one that I know of believes that one party should be all-European American (since many Latinos consider themselves white, it doesn't make sense to say "all-white" since that would not exclude Latinos). There are a few on the fringe who may believe in an all-European American party, but they have neither a following nor an audience. That makes the real argument about the means for broadening the GOP's base. I don't believe that survey or other data have made a very convincing case that this should be accomplished by adopting libertarian positions on immigration policy, lenient views of border enforcement, or by adopting an amnesty for illegal immigrants. The data simply do not show what many observers want them to show. Critical to the accumulation of knowledge on any subject is the importance of comparison. What we often lack in news and interest group use of survey data are the comparisons of other groups that would help adjudicate claims such as: Latinos voted Democratic because of Republican position-taking on immigration. How can we possibly know this is true if we do not look at other electoral groups to see how they voted? A group might look unique in its response to a particular campaign when there are no comparisons. When the relevant comparisons are considered, this uniqueness fades. 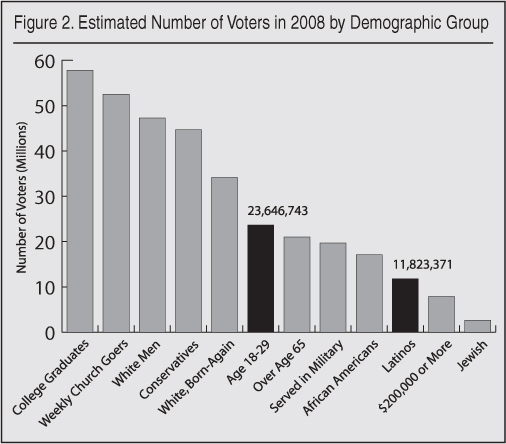 This is what the CIS Backgrounder tried to provide; a comparison of Latinos with other groups in the electorate. 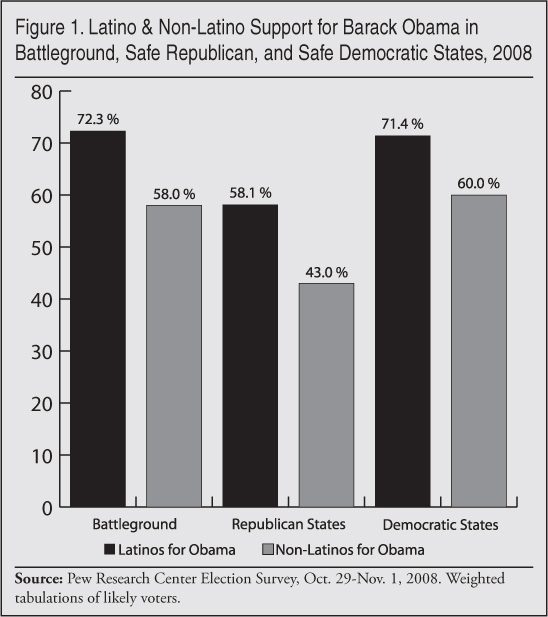 These comparisons show that Latinos were not at all alone in moving to the Democratic side in 2008 relative to 2004. Every group considered in the paper moved in that very direction. This makes it much less likely that the election was about immigration, since we know that many of these groups don't care much about immigration policy. Considered not just in isolation, but alongside the movement of so many other demographic groups, it appears that the election was about the economy and fears of joblessness and foreclosure, not about immigration. The other comparisons we need are comparisons across issue salience. Certainly a survey tabulation may indicate that immigration is "an important" issue for Latinos, but there are probably many issues that are ranked as "important": education, health care, jobs, crime, perhaps even gun rights, national security, and gay marriage. But that doesn't mean that any of these issues influenced the voting decision or steered a voter toward one party or the other. Voters will regularly express a strong preference for Coke over Pepsi, or strawberry over vanilla. But that does not mean that these entrenched views have direct relevance for the vote decision. Comparisons across elections, such as the House and Senate elections of 2008, are important too. One might carelessly to point to some Republican candidates who lost running on reform platforms as a repudiation of a particular policy view. But this ignores not only the Republican candidates who won with the same record, but the large number of Republicans who lost adhering to more liberal views on the subject, or whose views were unarticulated. Considered selectively and in isolation, observers will make a false inference from incomplete data. All of the contested outcomes need to be considered, those races where immigration was mentioned and those where it was ignored. We do know from decades of research that party identification is relevant for vote choice. It is the dominant consideration by virtually every account of political behavior. At the very least, then, when considering the impact of an issue position on the vote, pundits and commentators should control for the influence of party identification as a significant rival explanation. Most of the Latinos who consider immigration a highly salient issue are committed Democrats, plain and simple. They would not have voted for the McCain/Palin ticket under any circumstances. There are always a few exceptions, but the data suggest that they are a small number. Other control variables should include socioeconomic status, and possibly religion. Concerns about the economy should be included as a rival explanation for the vote. Voting decisions are often overly intellectualized by pundits, interest groups, and yes, even academics like myself. We probably want to believe that voters are more attentive to what's happening here in Washington than they really are. But the evidence for an elaborate issue-oriented worldview among anyone but the most elite voters is quite weak. Numerous investigators have found that respondents provide "off-the-top-of-the-head" answers to survey questions that do not have a deep anchorage in a lucid framework, but reflect temporary impressions, usually structured by a pollster's multiple-choice response options, that may change with the next survey. The resulting response instability doesn't mean we should abandon survey research, but we should be well aware of what simple survey tabulations can tell us. Does this understanding of the survey response mean that voters, Latino or otherwise, are stupid or politically illiterate? Not at all, but they do live busy lives, concerned primarily about family, work, and school. The amount of attention that they devote to political affairs is finite. They frequently use information shortcuts, called heuristics, to make judgments, and party identification is one of the most convenient of those. Voters also consult others in their environment, which is the reason I have highlighted the role of location of residence as an important influence on political learning (see here, for instance). They have a sense of whether the economy is doing poorly or doing well. We may all wish that voters had the time to pay attention to politics as closely as an interest group advocate in Washington does, but if they did, we wouldn't need these interest group advocates trying to tell them what they should think. In conclusion, we have every reason to doubt that immigration policy influenced the 2008 general election outcome. More generally, alternative explanations for election results go untested by the Washington advocacy and punditry corps. Comparisons with other groups, and comparisons with other issues are essential for evaluating specific claims. People express strong opinions about many issues, but this does not mean that their opinion is a determinant of their vote choice. Finally, interpretations of survey results should reckon with the knowledge we have accumulated about survey responses. Voters in open-ended discussion and deliberation on an issue will often shade and nuance responses that look clear-cut in a typical survey. This does not prove that voters are ignorant, but quite the opposite: they are preoccupied with more pressing things, and are often thoughtful. Faber, Ronald J., and M. Claire Storey. 1984. “Recall of Information from Political Advertising.” Journal of Advertising 13: 3: 39-44. Gerber, Alan, and Donald Green. 1999. “Misperceptions about Perceptional Bias.” Annual Review of Political Science 2: 189-210. Gimpel, James G. 2007. “Latino Voting in the 2006 Election: Realignment to the GOP Remains Distant.” Center for Immigration Studies Backgrounder. (Washington, DC: Center for Immigration Studies). Gimpel, James G. 2004. “Losing Ground or Staying Even: Republicans and the Politics of the Latino Vote.” Center for Immigration Studies Backgrounder. (Washington, DC: Center for Immigration Studies). Gimpel, James G. 2003. “Latinos and the 2002 Election: Republicans Do Well when Latinos Stay Home.” Center for Immigration Studies Backgrounder. (Washington, DC: Center for Immigration Studies). Gimpel, James G., and Karen Kaufmann. 2001. “Impossible Dream or Distant Reality: Republican Efforts to Attract Latino Voters.” Center for Immigration Studies Backgrounder. (Washington, DC: Center for Immigration Studies). Huckfeldt, Robert, and John Sprague. 1995. Citizens, Politics and Social Communication: Information and Influence in an Election Campaign (New York: Cambridge University Press). Kelly, Nathan M., and Jana M. Kelly. 2005. “Religion and Latino Partisanship in the United States.” Political Research Quarterly 58:1: 87-95. Kelly, Nathan M., and Jana Morgan. 2008. “Religious Traditionalism and Latino Politics in the United States.” American Politics Research 36: 2: 236-263. Lee, Jeongho, and Harry Pachon. 2007. “Leading the Way: An Analysis of the Effect of Religion on the Latino Vote.” American Politics Research 35: 2: 252-272. Lopez, Mark Hugo, and Susan Minushkin. 2008. National Survey of Latinos: Hispanic Voter Attitudes. Washington, DC: Pew Hispanic Center, July. Lopez, Mark Hugo, and Susan Minushkin. 2008. National Survey of Latinos: Hispanics see Their Situation in the U.S. Deteriorating: Oppose Key Immigration Enforcement Measures. Washington, DC: Pew Hispanic Center, September. Taber, Charles S., and Milton Lodge. 2006. “Motivated Skepticism in the Evaluation of Political Beliefs.” American Journal of Political Science 50: 3: 755-769. Taber, Charles S., Milton Lodge, and Jill Glathar. 2002. “The Motivated Construction of Political Judgments.” In James H. Kuklinski, ed. Citizens and Politics: Perspectives from Political Psychology (New York: Cambridge University Press) pp. 198-226.